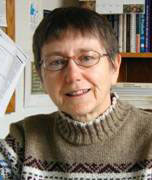 Home > Departments > Faculty > Karen Erickson Ph.D. I. Marine Natural Products Chemistry. This work involves the isolation, structural elucidation, and pharmacological investigation of secondary metabolites produced by marine plants and invertebrates. Organisms under study include algae, bacteria, sponges and corals. Metabolites of both chemical and biological interest are separated and purified chromatographically and then characterized spectroscopically. Modern nuclear magnetic resonance (NMR) methods represent our most important analytical tool for structure determination, but other spectral methods and chemical studies are employed as well. When necessary, partial or total synthesis of a compound is undertaken to complete the structural elucidation and/or to provide sufficient material for further biological testing. II. Mechanistic Organic Chemistry. An unusual base-induced ring enlargement reaction is under investigation. The intermediate, a vinyl carbanion, undergoes a "forbidden" 1,2-alkyl shift in a stereoselective manner. If the vinyl carbanion rehybridizes to a 1,2-carbene-anion, it can partition itself between two competing rearrangement pathways, one involving a single migration and the other involving a double migration. The extent to which each pathway is followed can be determined by the use of specific 13C-labelled substrates. This new representation of a vinyl carbanion as a carbene-anion is likely to be applicable to other puzzling reactions in the literature. K.L. Erickson, J.A. Beutler, J.H. Cardellina II and M.R. Boyd, "Salicylihalamides A and B, Novel Cytotoxic Macrolides from the Marine Sponge Haliclona sp. ", J. Org. Chem., 62, 8188 (1997). M.E. Francisco, M.M. Turnbull and K.L. Erickson, "Cartilagineol, the Fourth Lineage of Laurencia Polyhalogenated Chamigrene." Tetrahedron Lett., 39, 528 (1998). Z. Du, M.J. Haglund, L. Pratt and K.L. Erickson, "Carbanionic Rearrangements of Halomethylenecyclobutanes. The Role of the Halogen." J. Org. Chem., 63, 8880 (1998). F. Wan and K.L. Erickson, "Serinol-derived Malyngamide from an Australian Cyanobacterium," J. Nat. Prod., 62, 1696 (1999). F. Wan and K.L. Erickson, "Georgamide, a New Cyclic Depsipeptide with an Alkynoic Acid Residue from an Australian Cyanobacterium," J. Nat. Prod., 64, 143 (2001). M.A. Orsini, L.K. Pannell and K.L. Erickson, "Polychlorinated Acetylenic Acetamides from the Cyanobacterium Microcoleus lyngbyaceus," J. Nat. Prod., 64, 572-577 (2001). K.L. Erickson, K.R. Gustafson, L.K. Pannell, J.A. Beutler and M.R. Boyd, "New Dimeric Macrolide Glycosides from the Marine Sponge Myriastra clavosa," J. Nat. Prod., 65, 1303 (2002). K.L. Erickson, K.R. Gustafson, D.J. Milanowski, L.K. Pannell, J.R. Close, and M.R Boyd, "Myriastramides A-C, New Modified Cyclic Peptides from the Philippines Marine Sponge Myriastra clavosa," Tetrahedron, 59, 10231 (2003). M. R. Brennan, C. E. Costello, S. D. Maleknia, G. R. Petit, and K. L. Erickson, "Stylopeptide 2. A Proline-Rich Cyclodecapeptide from the Sponge Stylotella sp.," J. Nat. Prod., 71, 453-456 (2008). Shason Tang and Karen L. Erockson, "Synthesis and Cytotoxicity of a Salicylihalamide-A Analog," J. Nat. Prod., 71, 898-901 (2008).